Dr. Juli White earned her Bachelor’s degree in Biological Sciences from the University of California at Santa Barbara in 1992. She graduated from the School of Veterinary Medicine at the University of California, Davis in 1997. After graduation she completed a one year formal internship at Alameda East Veterinary Hospital in Denver, Colorado. This internship included additional training in Internal Medicine, Surgery and Radiology with a special emphasis on Emergency Veterinary Medicine and Critical Care. For two years after her internship, Dr. White practiced Emergency Medicine full time at Veterinary Specialists of Kansas City in Overland Park, Kansas. These two years of practice allowed her to continue her training in an informal setting by working side by side with board-certified specialists in Internal Medicine. Surgery, Dermatology, Opthalmology, and Radiology. 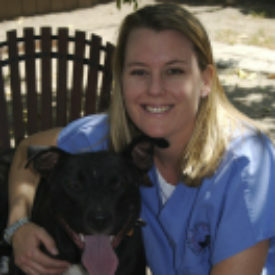 Since July of 2000, Dr. White has been a full time associate with the TrueCare for Pets in Los Angeles. In 2004 she expanded her involvement in the practice by becoming Staff Manager. She loves the excitement of Emergency and Critical Care Medicine and the pets and people that she gets to interact with on a nightly basis.